A regional daily has dropped the word ‘evening’ from its name while a free sister weekly has ceased publication. The Wigan Post, formerly the Wigan Evening Post, has followed fellow Johnston Press-owned daily the Lancashire Post, in nearby Preston, in changing its name. The changes see 10,000 copies of the Post’s Saturday edition, which now includes a 24-page lifestyle pullout, delivered free to homes across its patch. As a result of the relaunch, its sister freesheet the Wigan Reporter has closed. The new look Post came out for the first time on 11 February, while the Reporter ceased publication on 2 February. The newspaper also celebrated a sporting triumph yesterday with a front page wraparound. 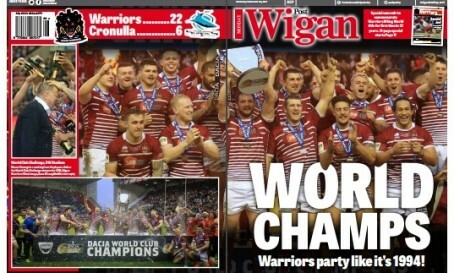 A special edition featuring a 12-page supplement was produced to mark rugby league side Wigan Warriors winning the World Club Challenge against Australia’s Cronulla-Sutherland Sharks. Sports editor Phil Wilkinson, reporter Tom McCooey and night editor Andy Williams worked late into Sunday night to produce the special edition while also providing online and social media coverage. Editors such as this one would have a little more credibility if they laid their cards on the table and were honest as to the reasons for the changes they’re making,it’s their business so they can do what they want after all,but have the courage of your convictions and just be honest about it, then at least potential readers and advertisers could make their own minds up as to whether to support them or not. paper thin excuses fool no one and in fact puts people off. True evening papers that hit the streets about 5pm and had several editions were the best fun to work on outside of the nationals. Morning regionals just don’t have vibrancy, especially with web news carrying immediate stories. So at least the paper has come clean about when it actually comes out. Sheesh, things are worse than I thought…. But seriously though. What is the point of calling a paper an evening paper when it’s printed as early as 2100 the day before as was happening with a few I can name. Better to drop it from the name and get them hitting the streets in the morning while at least some of the news is still relevant and can be read before people have already read it on their phone. Former loyal follower. I agree. The joy of evening papers was that they could scoop the nationals (morning papers after all) in the afternoon, and frequently did. Now the web has done them in. But it really was the best fun while it lasted.